Berlin Opticians Gallery is proud to present display only, the first solo exhibition by the French born artist Liliane Puthod. Puthod’s practice focuses on research into commodity fetishism, consumerism and industrial forms of production in the globalised world. In display only she brings together elements of sculpture, photography, print and the ready-made to closely examine our perception of the provenance of objects and their perceived value. For this exhibition, Puthod captures patterns and images from her immediate surroundings, be it shop displays or product catalogues and packaging, and re-appropriates them as part of her installation. She combines printed skies and marble textures together with a photograph of a window and a large-format portrait photograph reminiscent of a colour-shampoo ad, a wig and a set of ceramic heads and vases. By combining the fabricated and hand-made elements in an exhibition setting, Puthod attempts to create a heterogeneous environment, in which the value of each object can shift between what we, the viewer, see as its cultural and commodified value. This question of objects’ value and authenticity is explored further through their physical arrangement in the gallery. Puthod plays with the traditional modes of display. 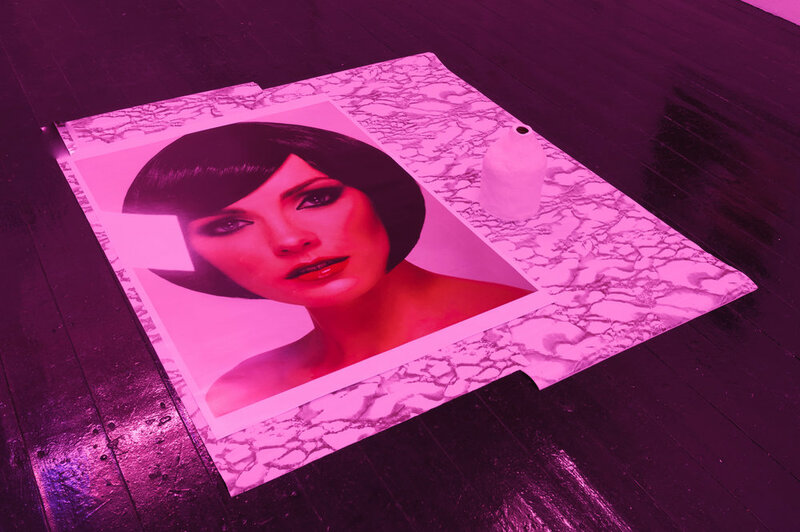 She places the portrait flat on the floor, while the wig rests in a transparent box on a plinth. 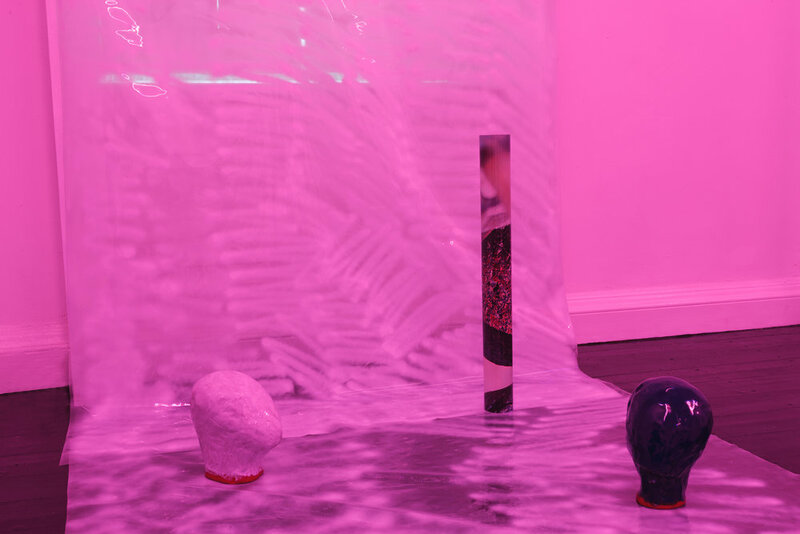 The arrangement is further distorted by the artificial, almost clinical pink lighting, which prioritises the surfaces of the objects over their substance. Puthod’s work leads to surprising connections between commodities, systems of production and hand-made products. By constructing narratives between these elements, she creates paradoxical situations in the exhibition space and forms connections between seemingly unrelated objects. The ‘one’ becomes the ‘many’ and vice versa. 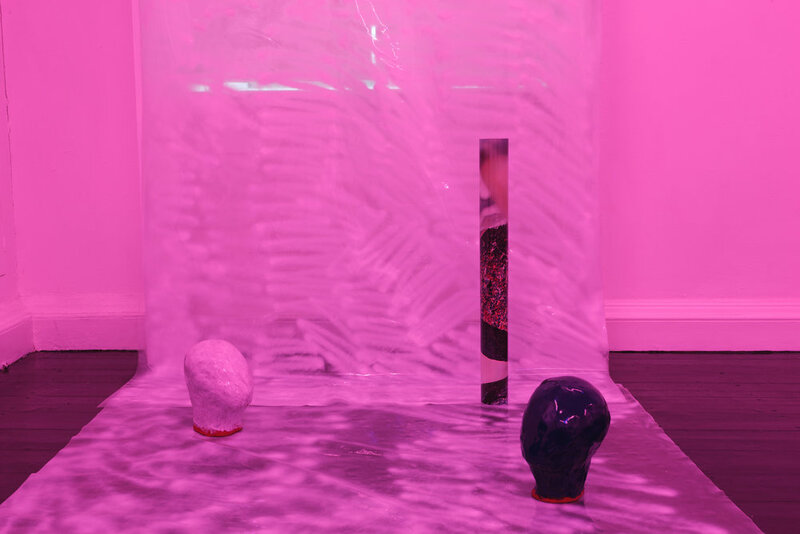 Through sculpture, digital media and text, she explores the way forms can belie and extrapolate themselves from the materials from which they are made. Born in France, Liliane Puthod is currently based in Dublin. Having graduated from a Master of Fine Arts from Geneva University of Art and Design (HEAD), Puthod has since been exhibiting extensively in Ireland and abroad. Recent projects and exhibitions include: The _____ Showroom of Lilian Cashman, Mermaid Arts Centre, Bray, Ireland, Symbol Symbol Symbol, Eight Gallery, Dublin, Ireland, Mejlby, publication funded by Geneva’s Art Council; Situs, a permanent installation at Geneva Champel Centre and The Existence ofFlamethrowers in your Street, curated by Catalyst Arts at 126, Galway, Ireland.